Did you know that in addition to being a professional fine art handling and shipping company, Fine Art Shippers also works with movies sets? We have years of experience moving various decorations and stage setting, and we are also proficient in organizing art spaces for any event. Besides, we partner with some of the best antique dealers who rent rare and unique pieces to film studios all over the United States. This all allows our fine art handling company to work with the leading decorators and set designers in New York City and beyond. However, there is nothing like working with famous and very talented film directors like Roberto Monticello! Roberto Monticello is an award-winning Cuban-born film director and writer who has been living in the Meatpacking District of Manhattan, NYC for 25 years. Moreover, he is one of those celebrities whom you can easily meet on the street or in the restaurant, so it is no wonder that residents call him the Mayor of the Meatpacking District. It is also impossible not to mention that in addition to directing films and writing, Roberto Monticello devotes much of his time to environmental causes and human rights, trying to help people as much as he can. 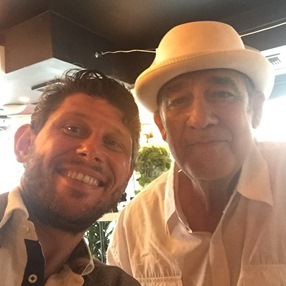 As a professional fine art handling and shipping company, Fine Art Shippers frequently visits the Meatpacking District of Manhattan, and it is always a pleasure for our team to meet Roberto Monticello and talk with this amazing person about art and cinema!